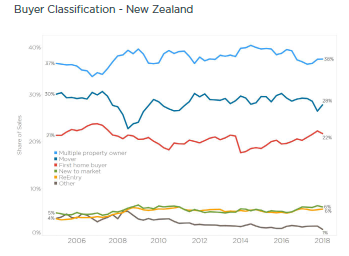 It’s always so fascinating to go beyond the top-level property statistics and see who really is buying property, because that’s where you can get real indicators of market change.CoreLogic has a unique set of buyer classification data which enables us to do just that and the latest stats make for a very interesting insight. According to the results in the CoreLogic February Property Market & Economic update , ‘Movers’ (those that have sold and purchased again - literally moving between two properties) have bounced back from their nationwide Q4 2017 slump. ‘Multiple property owners’ (the envy of renters everywhere, those that are building their own property portfolios) have remained consistent with 37.5% of sales. CoreLogic Head of Research Nick Goodall comments: “We have previously noted a reducing share of those multiple property owners that need a mortgage to purchase but this group actually had a stronger month in January, accounting for almost two-thirds (66%) of purchases going to multiple property owners (a jump of 4%)”. Perhaps those lower interest rates are enabling larger loans. To get a good understanding of what’s going on in NZ’s property market; download your free copy of the CoreLogic February Property Market & Economic update. It covers main economic factors that influence the housing market, and then looks at sales volumes, values, and active buyer types in both the national and main centre housing markets.